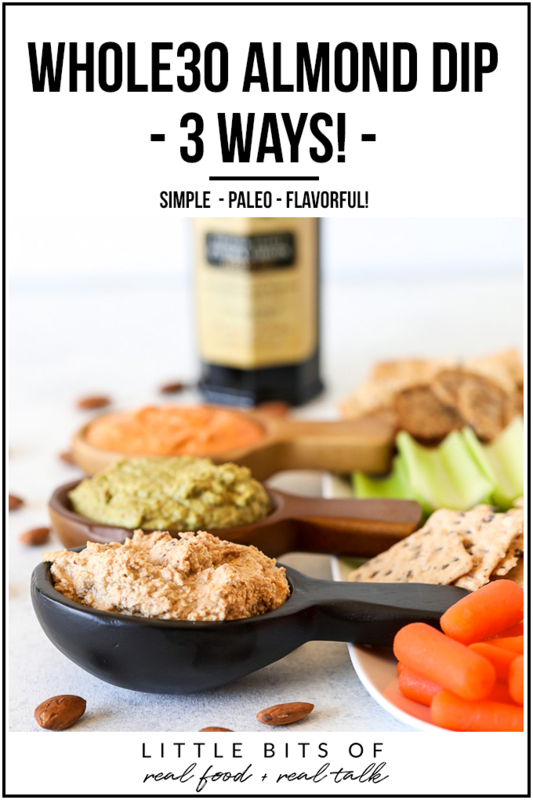 I am a huge fan of appetizers and dips but once you do a Whole30 you realize there aren’t a ton of super clean and healthy dips out there! I used to be a huge fan of hummus (and still am) but when you cut beans out… that craving is still there! 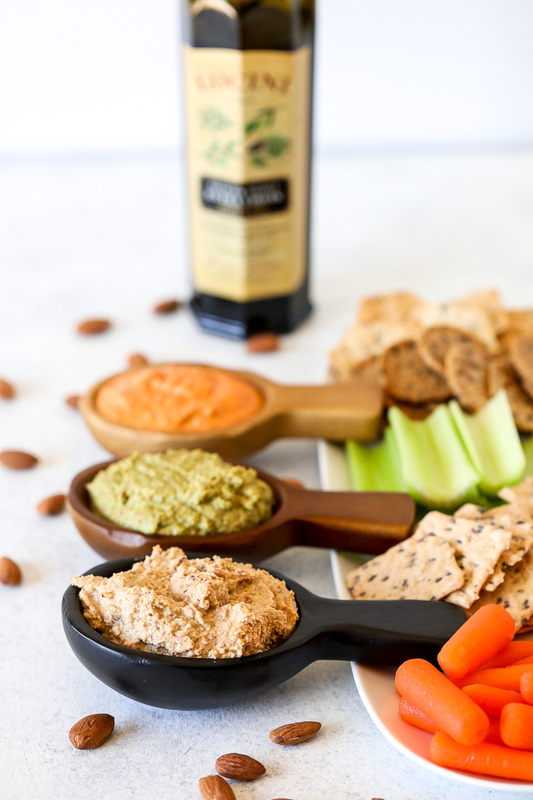 So once Catherine and I tried an almond dip from Whole Foods we knew we had to recreate it. 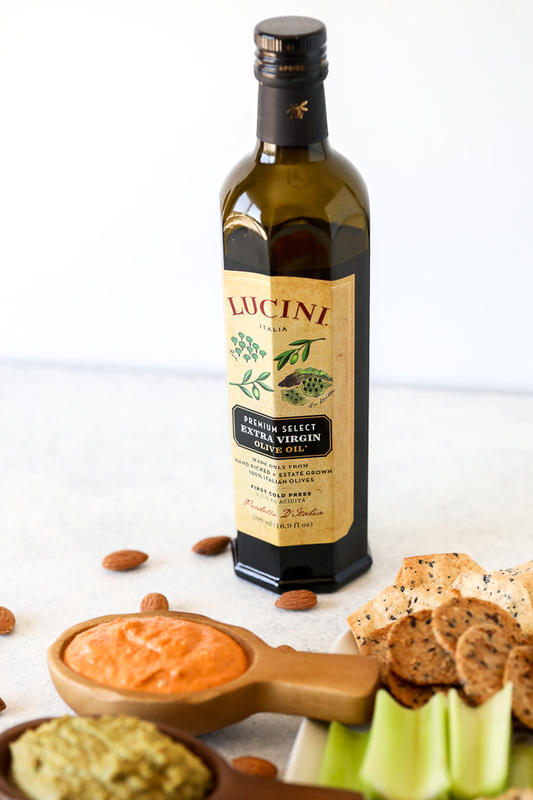 So I’m not only excited to share three variations of this recipe with you today but also introduce you to a new brand I’m working with – Lucini Italia! 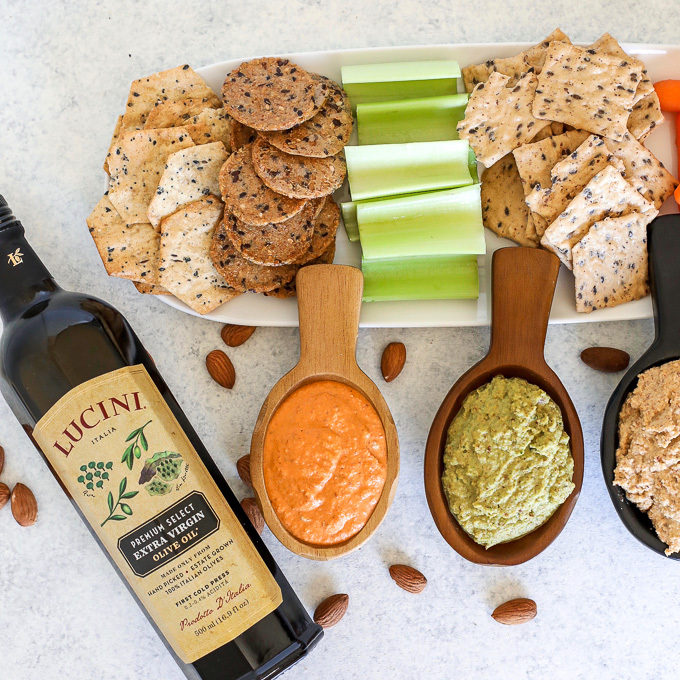 Lucini uses 100% natural ingredients in all of their products and they are super high quality, which of course we love. 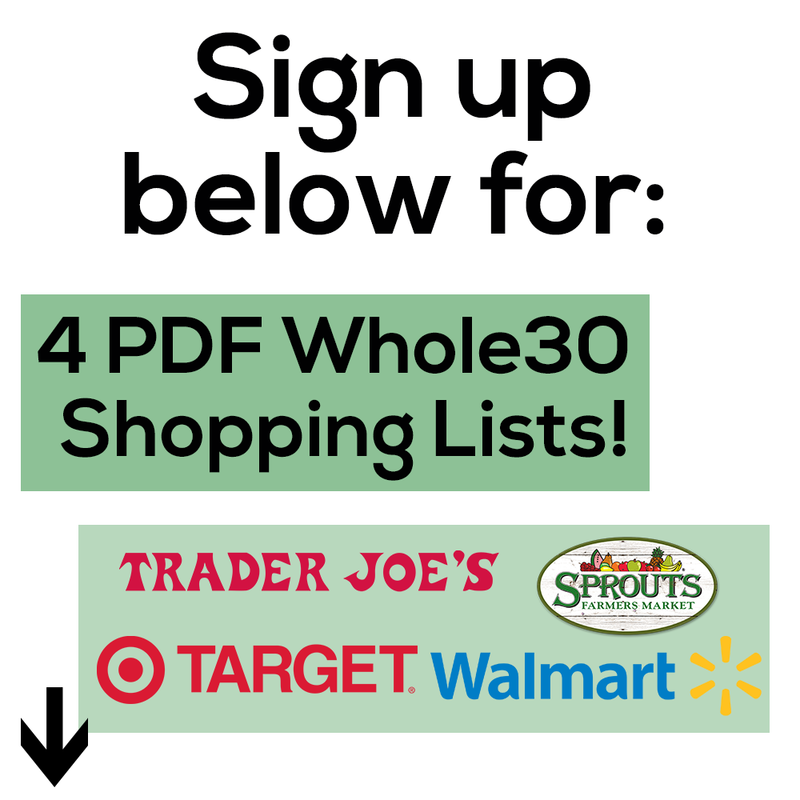 They also make tomato sauces that are whole30 compliant and great for topping meatballs and veggie noodles! 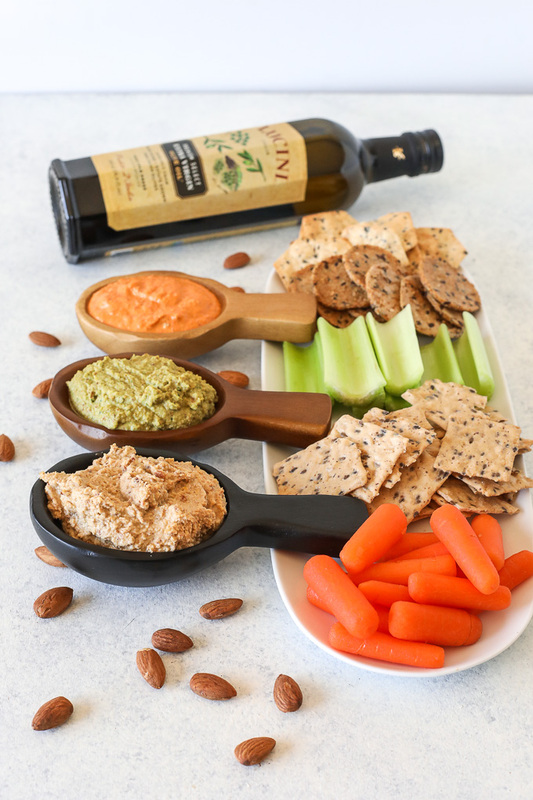 As for this almond dip, I used their extra virgin olive oil to make it smooth and add flavor! And if you are an amazon lover you can grab this oil here! This dip is my new FAVORITE. I’m going to be bringing it to all the parties this spring and summer. 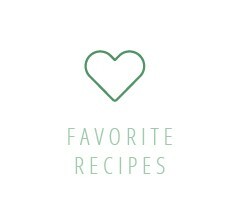 The only thing that takes time is soaking almonds, then you just blend everything in a food processor and enjoy! 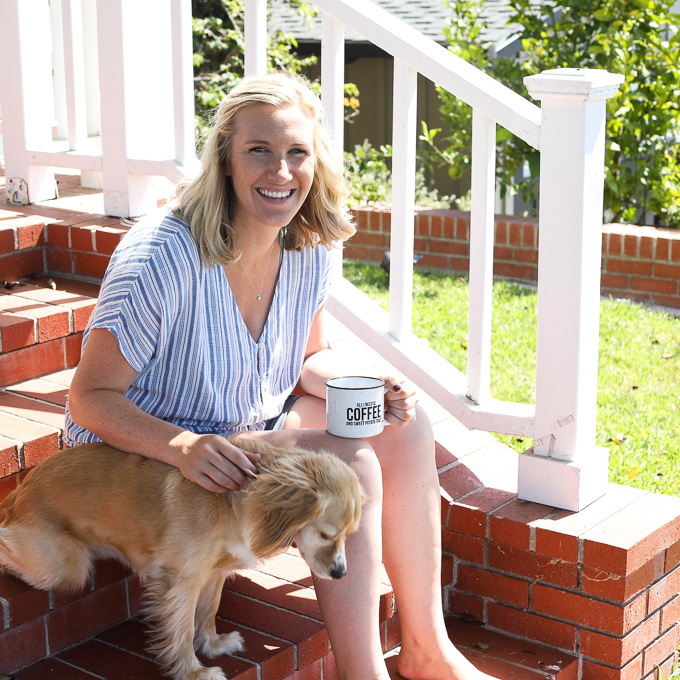 If you are whole30ing you can use carrots, celery, bell pepper… and any other veggie to scoop all the goodness up! So let’s get dipping shall we? Once you start using good quality olive oil, you can never go back!! This post is sponsored by Lucini Italia but all views are 100% my own! 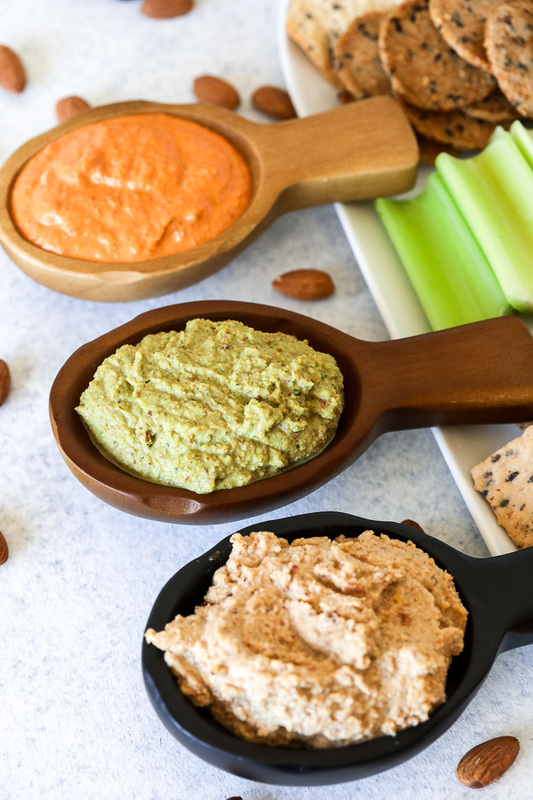 All 3 of these dips are incredible and I can’t wait for you to try them! 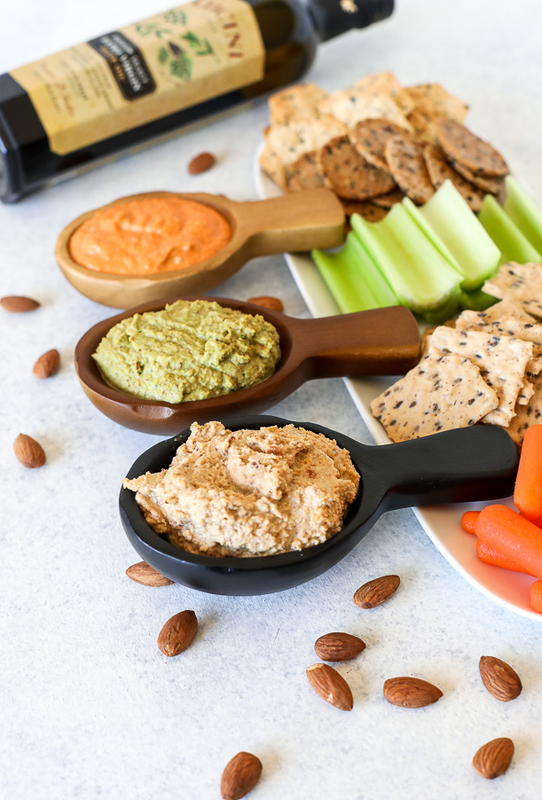 Pin the image below to save these Whole30 Almond Dip recipes for later! Once your almonds have soaked in water for 4-12 hours, drain the almonds then add them to a food processor. 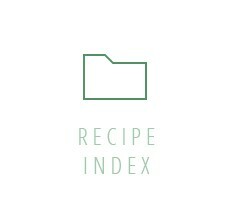 Add in 1/2 cup of water, lemon juice, lemon zest, olive oil, coconut aminos, nutritional yeast, minced garlic, garlic powder and onion powder. Blend on high for a few minutes until the almonds have broken down completely and dip is relatively smooth. Season to taste with salt and blend again. Add in 1/2 cup of water, lemon juice, olive oil, coconut aminos, nutritional yeast, garlic powder and basil. Blend on high for a few minutes until the almonds have broken down completely and dip is relatively smooth. Add in 1/2 cup of water, lemon juice, olive oil, roasted red peppers, tahini, nutritional yeast, and garlic powder. Blend on high for a few minutes until the almonds have broken down completely and dip is relatively smooth.